What Does Bolt Pattern Mean? How Can I Measure My Bolt Pattern? Why Is Wheel & Hubcentric Fitment So Important? Do You Sell Hubcentric Rings? How Many Wheel Adapters Do I Buy? Can You Make Me Custom Adapters? What Stud Size Do I Need? What Size And Style Lug Nuts Do I need? Why Hex Head Lug Bolts? Why Short Head Lug Bolts? How Do The Pry Slots Work? Centering Ring vs. Hubcentric Ring? How Do I Measure Wheel Center Bore? Will Your 5x130 Adaptors Clear My Brakes? Bolt pattern refers to the spacing of the wheel mounting bolts around the hub. This spacing positions the mounting holes equally upon a calculated circle surrounding the hub. Using 5x112 for example, "5" refers to the number of wheel bolts. "112" refers to the diameter of the circle, in millimeters, that the mounting holes are placed upon. 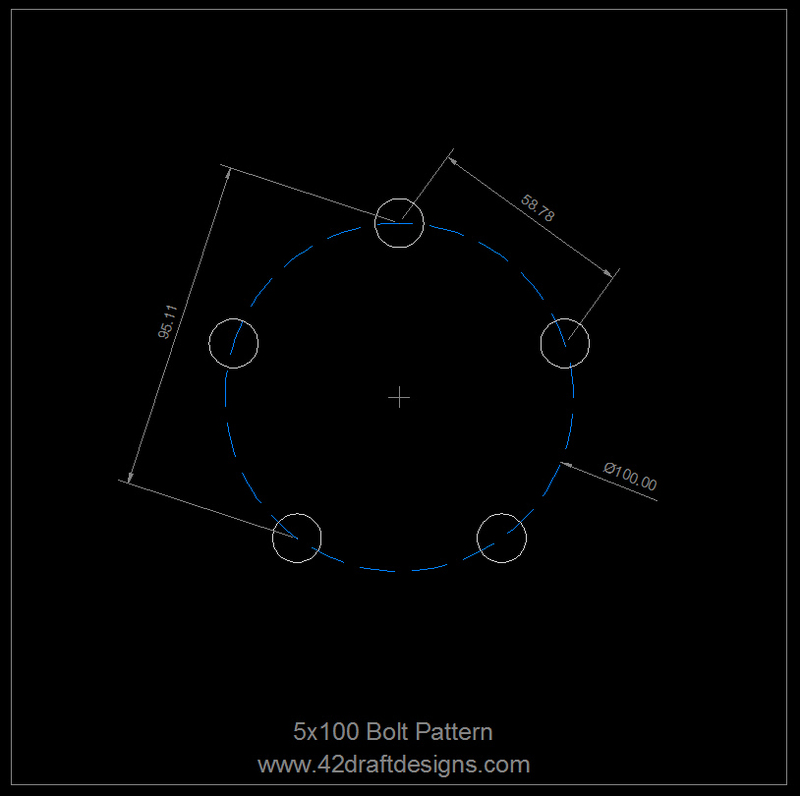 "Bolt Pattern" is also known as "PCD" (Pitch Circle Diameter) or "BCD" (Bolt Circle Diameter). We like Bolt Pattern. These days you shouldn't have to measure your bolt pattern. Unless you're attempting to fit a wheel of completely unknown origin, the bolt pattern of your wheel and your vehicle should be well documented online. 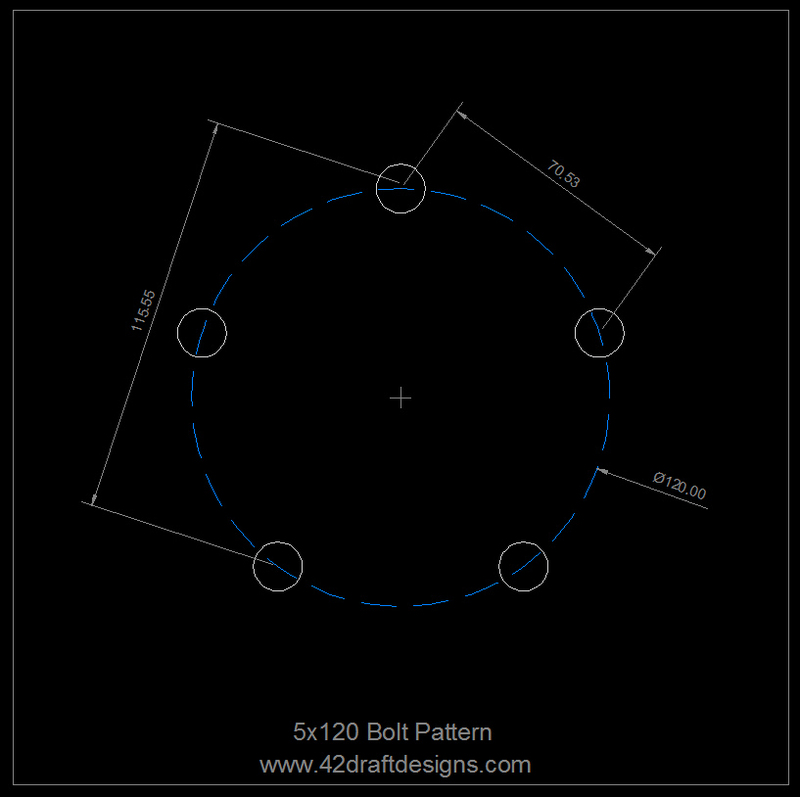 If you do find yourself measuring a 5-bolt pattern, check out the drawings below for reference. Center bore refers to the machined hole in the center of a wheel, wheel spacer, or adaptor. 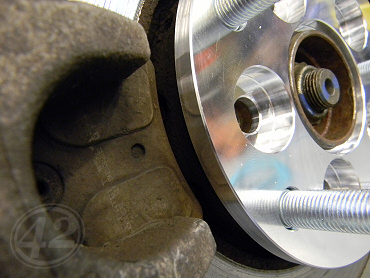 When installed on the vehicle hub, the center bore of the wheel slides over the hub creating a concentric fit. Center bores are described by their diameter in millimeters. When performing a wheel conversion, the center bore of the wheel is typically different in size than the vehicle. In our case, we machine the center bore of the adapter to fit the hub. We include a centering ring to convert the adapter to the center bore of the wheel. For example, most Mercedes wheels have a 66.56mm center bore. Our adapters are machined with a 57.1mm center bore to fit the VW/Audi hub. We include a 66.56mm centering ring to fit the Mercedes wheel. The term hubcentric is used to describe a wheel, wheel spacer, or wheel adaptor that aligns itself with the vehicle's hub. For example, most VW/Audi vehicles are equipped with male hubs that measure 57.1mm in diameter. The OEM wheel that fits this hub has a 57.1 center bore, therefore it is hubcentric. A wheel spacer or adapter that has a 57.1mm center bore would also be considered hubcentric. When a hubcentric wheel, spacer or adapter is installed, the wheel is naturally aligned with the hub. Forces generated by normal driving are transferred directly to the hub. Without hubcentric fitment, all forces are transferred to the lug bolts. It is impossible to perfectly align the wheel and vibrations will be felt. If a wheel spacer or adapter has been machined with a center bore greater than the size of the OEM hub it is NOT hubcentric. Avoid this type of wheel adapter or spacer at all costs. Wheelcentric is a term specifically used to describe wheel spacers and adapters. A wheelcentric spacer or adapter has a machined protrusion on the wheel side that matches the center bore of the wheel to be installed. Typically, wheelcentric spacers extend the exact size of the hub for use with the existing wheel. Wheel adapters often change the size of the hub to suit the wheels being installed. Both wheelcentric and hubcentric fitment is important to proper wheel fitment. When extending the hub, changing the bolt pattern, and installing a different wheel it is absolutely critical to align the wheel to the adapter to the hub. Vibrations are the enemy when using wheel adapters and can be very easily avoided by purchasing the proper adaptors. Here's a scenario: A set of budget adapters are installed on a 2010 GTI. These adapters are far from hubcentric. The center bores are oversized beyond 65mm. When bolting the adapter to the car, care is taken to even tighten the lug bolts in an effort to accurately center the adapter. Once bolted to the car, the new wheel is slid over the studs and tightened up. The studs should align the wheel, right? The adapters have no wheelcentric features. Driving down the road, vibrations are immediately felt. The car is pulled back into the garage and the wheels are removed to inspect. With 8 possible connections off-center, who knows where to start? Care was taken to mount the adapters properly, so the wheels are carefully re-installed and evenly tightened. Vibrations seem to have calmed down, but are still present. After a few more remove and re-install trips, the car heads home with wheel vibrations that are decided to be dealt with. Cruising down the highway, the wheel vibrations seem to get worse with speed. Despite being torqued to spec, things are moving around as opposing forces pull the wheel away from the hub and the hub away from the wheel. Soon vibrations get worse, then things get serious. Vibrations have caused the adapter mounting bolts to loosen. The wheel is now loose, and the driver heads for the shoulder. Luckily, the wheel stayed on and no one was hurt. The alternative to this scenario is drastically different. Proper wheel and hubcentric adapters were installed, no vibrations were felt and no issues have been experienced. 42 Draft Designs only manufactures wheel & hubcentric wheel adapters. Hubcentric rings are used to change the center bore of the wheel in order to achieve hubcentric fitment. Typically made of plastic, these rings press into the inside of the wheel and align the wheel with the hub. When the proper hubcentric rings are used, hubcentric wheel fitment is successful. Typically, OEM wheels are machined to fit the vehicle and do not require hubcentric rings. Aftermarket wheels normally have large center bores and rely on hubcentric rings for vehicle specific fitment. At this time 42 Draft Designs does not sell or manufacture hubcentric rings. There is an incredible selection of hubcentric rings available on the web. If the hubcentric ring you need is not readily available, you're probably already looking into a set of adapters. Wheel offset, also known as ET, is a measurement of the distance between the mounting surface and the true center of a wheel's width. This measurement can be positive or negative and is described in millimeters. A wheel with an offset of 0 has a mounting surface located along the centerline of the wheel. Wheels with negative offsets have mounting pads closer to the inside of the wheel. Wheels with positive offsets have mounting pads deeper in the wheel, closer to the face. Most modern FWD and AWD cars have wheels with positive offsets ranging from 20-50mm. 42 Draft Designs Wheel Adapters are sold in matching pairs. One pair = 2 adaptors. To adapt wheels to your entire car, you will need to purchase 2 sets of adapters. Typically our customers purchase two pairs of different thickness in order to achieve a staggered look. Unfortunately we cannot make custom adapters. Our adapters are manufactured in production quantities based on the range of sizes and conversions we offer. We are not setup to handle custom orders and would not be able to deliver within a reasonable timeframe. If custom is your only option, there are many other machine shops out there that specialize in custom adapters. The thickness of your adapter will be dependent on the width and offset of your new wheel. Many other factors play a major role in wheel fitment, including suspension geometry, tire size, and the unique shape of your vehicle. It's impossible to list a fitment chart, so we've put together a step-by-stepguide to figuring it out. Stud size is an option for many of our conversions. In many cases, we've chosen the stud size and length that fits 99% of the wheels available in your bolt pattern. If you have the option of stud size be sure to measure your wheel before ordering. Adapters that offer a choice of studs fit a true assortment of wheels. The wrong choice may not fit your wheels. M12 studs will fit in a 12-13mm hole. M14 studs will not. M14 studs will fit in a 14-15mm hole. M12 studs will fit in a 14mm hole. The lug nuts will work. If given the option, we prefer to match the stud size to the wheel exactly. Safety First. In some cases M12x1.5 Extended Studs will be available. Extended studs are necessary when your wheel has a thick backpad. Typically, the backpad is 10-15mm thicker than a normal wheel requiring a lug bolt or stud 10-15mm thicker. Given the wide range of wheels used with adaptors, sometimes you won't know you need extended studs until it's too late - unless you measure. Let's compare an OEM wheel setupto your new wheels. If you dropan OEM lug bolt into your OEM wheel you can measure the distance that the lug bolt protrudes through the mounting pad. OEM lug bolts typically measure 27mm long from the bottom of the seat to the end. A fully threaded lug bolt has 27mm of threads and protrudes 18-20mm. Now dropthe same lug bolt into your new wheel. It should protrude 18-20mm. If not, you may need extended studs. Our normal studs protrude 30mm from the adapter, so you have some wiggle room. If your lug bolt protrudes 13-20mm you do not need extended studs. If your lug bolt protrudes less than 13mm, you need extended studs. Our extended studs are 15-20mm longer. Lug nut size is easy. If no stud size choices have been offered, we will force you to choose a lug nut that fits. If you have a choice of stud, be sure to match your lug nut size to the stud size you've chosen: M12x1.5 stud - M12x1.5 Lug Nut for example. If you choose the wrong diameter, we will probably send you the correct diameter based on the studs you selected. Style is a bit tricky. We offer lug nuts with a choice of ball seat or cone seat. Ball seat lug nuts are typically used with OEM wheels. Cone seat lug nuts are typically used with aftermarket wheels. It's important to choose the correct seat. Before ordering, grab your wheel and feel the lug bolt/nut mounting surface with your eyes closed. If the surface seems to contour to the pad of your finger, you need ball seat. If the mounting surface seems to be a straight taper, you need cone seat. The difference is easily recognizable and documented in our Visual Glossary. Porsche wheels require a unique type of ball seat lug nut. Compared to a typical OEM VW/Audi ball seat, the Porsche ball seat is much larger in every way. VW/Audi ball seat features a 12mm radius. Porsche features a 13mm radius and a much larger overall diameter. VW/Audi ball seat hardware typically uses a 17mm socket. Porsche uses a 19mm socket. When viewed side-by-side the difference is obvious. If you're using Porsche OEM wheels you MUST choose Porsche Ball Seat Lug Nuts. If you're using an aftermarket Porsche wheel or another wheel with 5x130 bolt pattern you must be absolutely sure before ordering. Check out our Visual Glossary for comparison photos. No matter what style of lug nut you think you need, double check. Using the wrong style lug nut WILL damage the wheel and may result in your wheel coming loose. Safety First. Hex head lug bolts are used because of their shallow head and large, flat mating surface. In order to safely mount an adapter as thin as 15mm, shallow head bolts must be used. If a normal lug bolt was used, the heads of the mounting bolts would interfere with the wheel. Using our hex head lug bolts, 15mm and 18mm adapters are safe and possible. Given a choice, we prefer short head lug bolts when the thickness of the adapter allows. Short head lug bolts use a traditional tapered mating surface that allows for better structural integrity as the adapter increases in thickness. The heads of these lug bolts are designed to be short, allowing the lug to recess into the adapter. Colored anodizing would provide a great finish for our wheel adapters, but we chose to skipit. Without a local anodizing shop, or even an established relationshipwith a regional shop, we are unable to offer an anodized finish without significantly delaying turnaround time and increasing price. Given the competitive nature of the essentially custom wheel adapter market and the time sensitive demands of show season, we have decided to not offer an anodized finish at this time. In the future anodizing may be a possibility. Anodizing does offer some corrosion protection, which was part of our decision making process. Despite the corrosion protection benefits of anodizing, our decision remains the same. To learn more about corrosion and wheel adaptors, continue on to the next FAQ. Corrosion is nature's way of reminding us who's in charge. The air we breathe, the rainwater, and the road salt we drive through will begin to corrode your wheel adaptors the day they're installed. The various types of metal involved will even react with each other. It's inevitable, but not the end of the world. Let's talk about the various parts of wheel adaptors, the reality of corrosion, and what can be done to avoid it. Wheel adapters are made from aluminum alloys. Exposed to the elements over a period of time, raw aluminum reacts with oxygen to form a thin layer of aluminum oxide on the surface. This layer will appear dull or chalky. Despite the dull appearance, this layer actually protects the aluminum from deeper oxidation. It may be dull, but your wheel adapter is certainly not melting away. The vehicle hub is made of raw carbon steel. 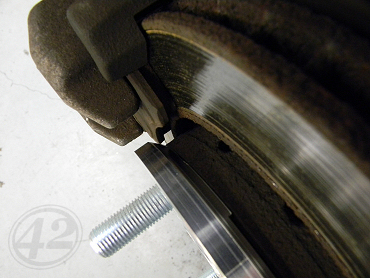 Typically, a brake rotor sits on the face of the hub, creating a mating surface of raw steel for the wheel and hub. When dissimilar metals are joined, galvanic corrosion occurs. Galvanic corrosion can best be described as an exchange of ions between the metals due to a molecular level electrical reaction. The result of this exchange is a bond most glues would envy. Luckily, the reaction between steel and aluminum is only mild compared to other dissimilar metals. Have you ever had an aluminum wheel stuck to the hub? This isn't caused by rust, it's galvanic corrosion. The only way to remove the wheel was with a swift kick, right? Adapters can't be kicked, so we strategically added pry slots on the hub side of our wheel adaptors to assist in removal if they get stuck. We've seen and heard horror stories of stuck adapters. The adapter barely gets out alive. Galvanic corrosion can happen to any aluminum adapter and any aluminum wheel, regardless of finish or price tag. Don't panic though, there are ways to prevent it from happening. If your hub and adapter are both raw metal, a thin layer of anti-seize can be applied to the mating surfaces to prevent corrosion. Anti-seize compound is filled with copper dust. Adding another dissimilar metal to the mix disrupts the reaction that causes aluminum to stick to steel. Various metal treatments and finishes can help. Anodizing of the aluminum adapter helps, but only short-term. Over time, tiny cracks form in the anodized layer exposing raw aluminum. Many brake rotors are supplied with a zinc or cadmium electroplated surface. Electroplating deposits a sacrificial layer of metal on the surface of the steel. This metal corrodes first, protecting the steel underneath from the elements. Some brake rotors are even painted! While the paint doesn't last on the surface of the rotor, it does protect the mating surface, stopping galvanic corrosion completely. Hardware. To prevent corrosion of the mounting hardware, we use zinc plated steel wherever possible. Zinc plating stops galvanic corrosion from bonding the hardware to the adapters. It prevents the environment from attacking the threads, and it keeps steel from sticking to steel via rust - another favorite of ours. A stainless steel wheel adapter would be so heavy and so incredibly expensive that no one would want one. Not to mention, stainless steel fasteners don't have the tensile strength to safely hold a wheel in place. There's more reasons, but no reason to list them. Corrosion is everywhere. It's inevitable, but it's NOT a major concern. We've taken the time to explain the different types of corrosion and how they apply to wheel adapters. We've taken steps to protect our wheel adapters and assist in the event of a stuck adapter. If you live in a wintry area, consider winter wheels. If you are concerned about galvanic corrosion, follow our instructions to apply anti-seize upon installation. If not, bolt-upyour adapters and enjoy the season. You have nothing to worry about. The pry slots are shallow pockets machined into the hub side of the adapter. These pockets are located inline with the mounting bolts where the tightest bond occurs. To remove a stuck adapter, simply insert a large screwdriver or thin pry bar into the slot and pry the adapter away from the hub. If the adapter remains stuck, work in a star pattern attacking each of the mounting holes until the adapter breaks loose. 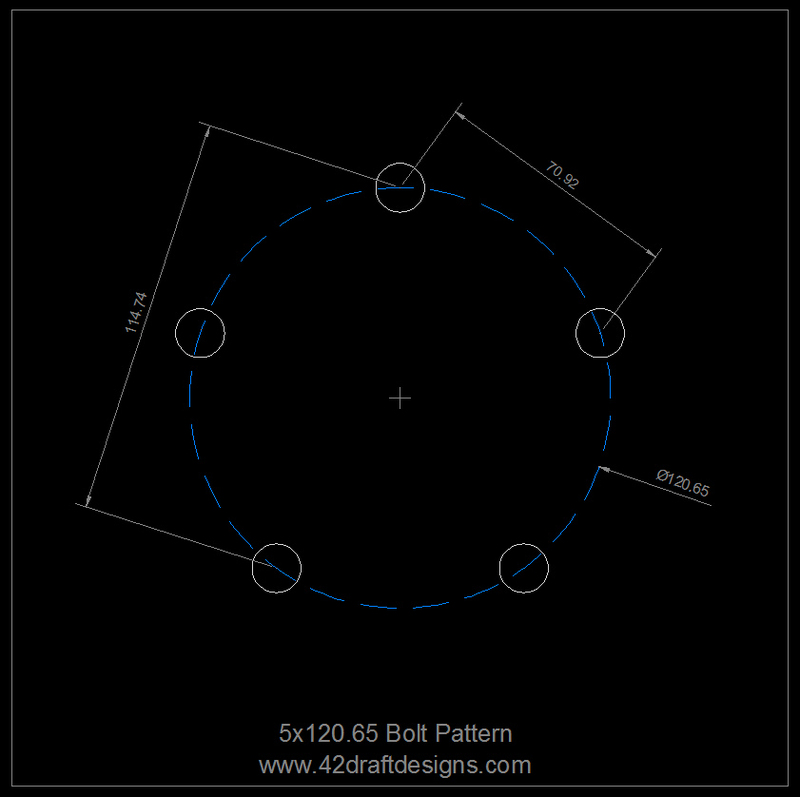 A centering ring is a ring designed by 42 Draft Designs to be used only with 42 Draft Designs Wheel Adapters. Centering rings install in the wheel side of our wheel adapters and fit the exact center bore of the wheel to be installed, allowing true hubcentric and wheelcentric fitment. 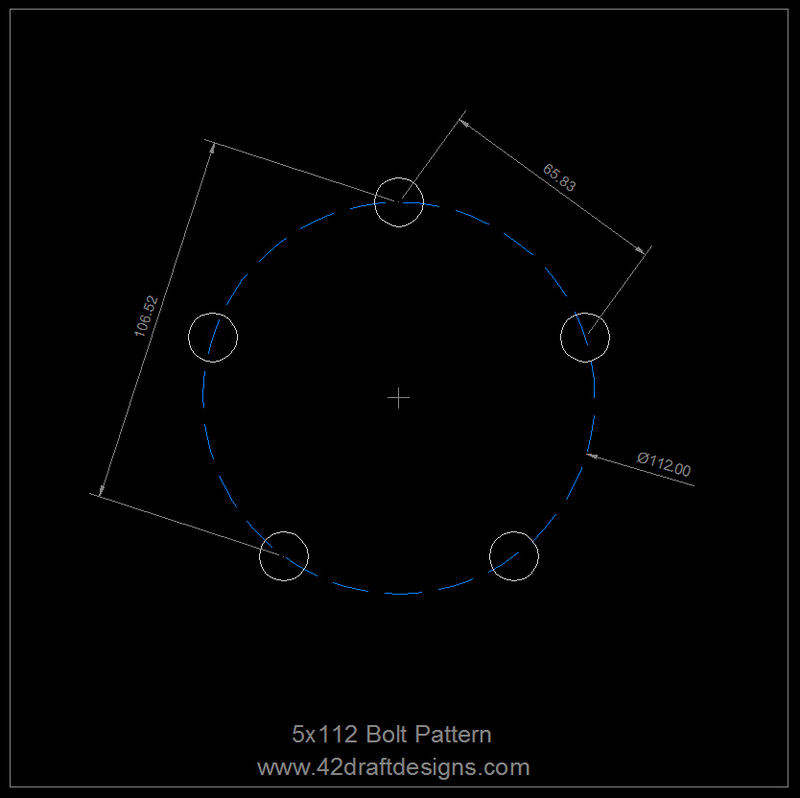 42 Draft Designs centering rings cannot be used for any other purpose. Hubcentric rings are universal rings designed to install in the center bore of a wheel, changing the diameter of the center bore. Hubcentric rings are designed to fit inside wheels - sometimes universal, sometimes specific. Hubcentric rings are typically not necessary with wheelcentric adaptors and only available in common sizes. Wheel center bore can be difficult to accurately measure. Before heading out to measure your wheel center bore, do some extensive research online. Unless you're running a completely unknown wheel, the center bore of your wheel or the vehicle it came from will be published online by someone. If you don't trust the published size, measure your wheel. 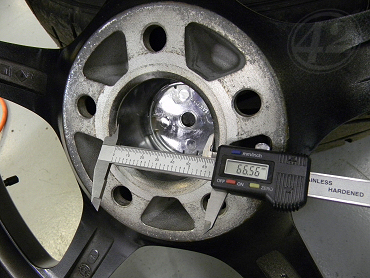 Wheel center bore cannot be measured with a ruler. It can't be compared to a print-out from a picture. The easiest and most accurate way to measure wheel center bore is with a dial caliper - digital or analog. Digital calipers are much easier to find these days and will convert Metric and American units with the touch of a button. We like digital. To accurately measure your wheel center bore, first lay your wheel on a soft surface to avoid scratches. If the center bore has ANY corrosion, clean it with a coarse Scotch-Brite pad. Using the ID jaws of your caliper, measure the center bore at 12 and 6 o'clock. Be sure the jaws are placed equally in the circle and sitting flat against the metal. Wiggle the caliper until the jaws sit flat and you see the largest measurement. Repeat this measurement three more times inside the circle, rotating the wheel 120° each measurement. The largest accurate measurement found will be your center bore. This measurement should match the other three. If in doubt, measure your other wheels to achieve an accurate average. Installation is simple, however it is very important to follow our installation instructions step-by-step, use the proper tools, and torque all hardware to the recommended specs. 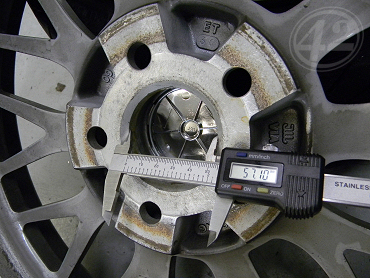 Proper adapter installation is key to a safe and successful wheel conversion. 5x130 adapter clearance is a common problem that's rarely talked about. The problem lies in the diameter of the adaptor body. 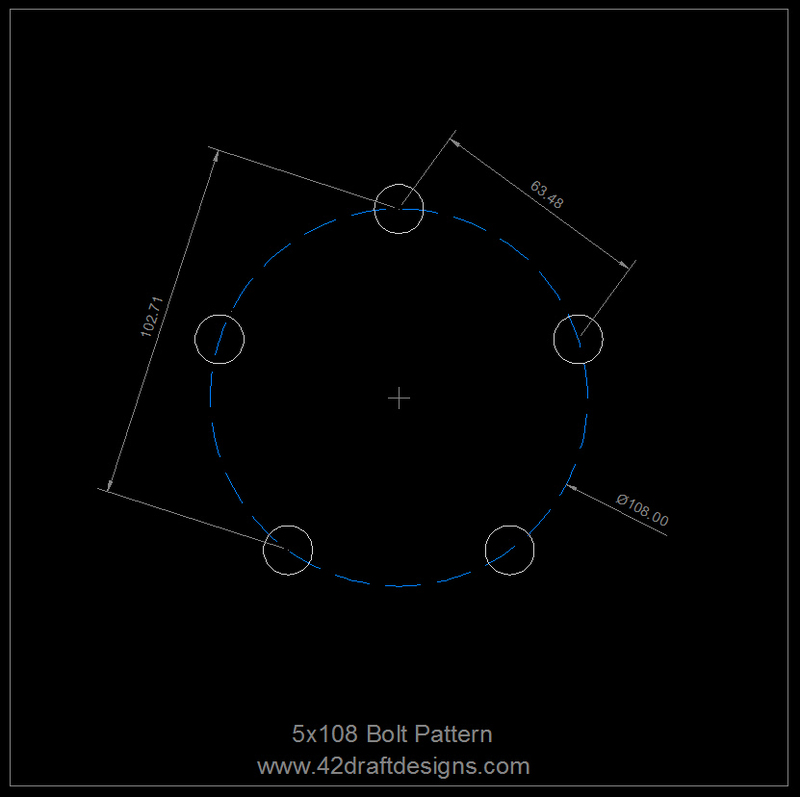 In order to stud a 5x130 bolt pattern, the size of the adapter body must be increased. When the adaptor body is increased beyond 6" in diameter it begins to approach the brakes. Every car is different, front and rear. Sometimes the adaptor touches the brake pad, other times it touches the caliper. When the problem does occur, the culprit is typically a 6.5" round adaptor with a square cut back. To avoid interference with the brakes, our 5x130 adapters are cut to 6.375" in diameter. We've added the largest chamfer relief we can to the back of the adapter. This relief adds just enough room to clear the tightest and tallest brake pads. Check out the following pictures. This is a 15mm 5x100 - 5x130 adapter installed on the rear of an Audi TT.